The Royal "Radio Mill" in my private collection is one of the more interesting typewriters I own. The typeface (10 pitch all-caps) is very easy to read. Considering its purpose, that makes sense. I've been using it recently to make lists for our Sunday shopping. It is a fairly mundane task and I am sure that there have been far more important things that a 10 pitch radio-mill Royal would have done in its life. 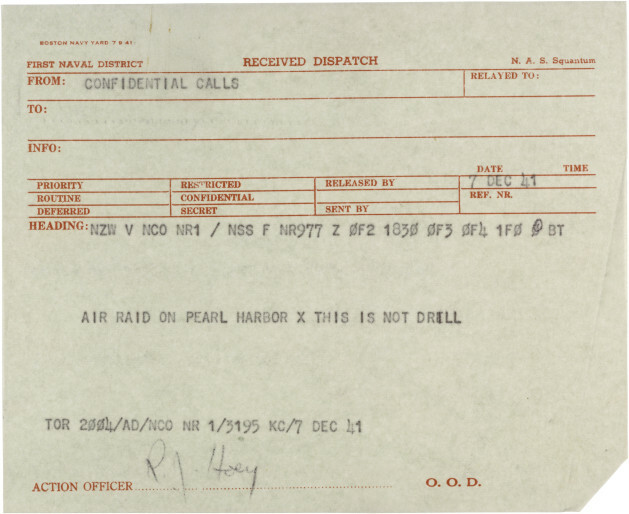 This is a naval dispatch is dated 7 DEC 1941; a date that will live in infamy. I found it while browsing the National Archives web page. This particular dispatch was sent to Sqantum Naval Air Station outside of Boston. When you see something like this it really makes history come alive. 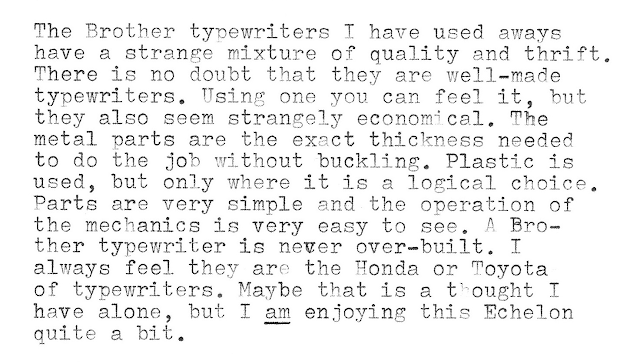 I started working on cleaning up a typewriter that has sat neglected for a while. It's this Sears Tower. Many of you know it as a Skyriter and it is one in every aspect except name. This particular machine is missing the decorative paper arm cover. It is a common piece to find missing. I was looking out the sliding glass door at the butte behind our home. (There's another one in front of our house called Deem Hill.) The sky was a pale blue. A haze covered the finer delineations of the rock face. Falcons and eagles circled overhead slowly catching thermals rising and then falling. The hilly country of the Sonoran desert has a stark beauty. It takes time to learn to appreciate it, but the beauty is there to find. I started to think about the name Tower. It's an odd name to give a typewriter. It makes me think of the towers of Silence that played a significant role in the funerary rights of the Zoroastrians. Was this little Tower left to decay out of sight? Will the carrion artists pluck key tops and repurpose them as horrible rings and necklaces? Who will sweep your brittle remains into the ossuary? I happen to have another Tower from Ton S. This Tower is Presidential, the one above is a Chieftain. A Chieftan of what? It's fitting that not too far from my home is an amazing museum: The Deer Valley Rock Art Center. At this off-the-beaten-path museum you can see petroglyphs dating back 7,000 years. Could they be neolithic blog posts? Is this an heir to the kingdom of the Hohokam? A rock and an idea. It could be the ultimate in distraction-free writing. Back to this typewriter. As with most 1950s Smith-Coronae, the sound-deadening material smells very bad. It has a must that can only be eliminated by removal. I was able to remove the offending odor and get to work on the dirty mechanism. It's not a big job, but it might take a few days. Today was the first day that a student wanted to use the copper-painted Hermes Ambassador. I fitted it out with a nice green ribbon from Baco and let a young lady in my first hour have a go at this freshly customized typewriter. After reading a post by Will Davis about a very mysterious Webster, I decided to look at the CTP collection. When I really started looking there were actually quite a few. Many are rebrands, but two are the real-deal. During journals the other day, I grabbed a few pictures of busy typing hands. The Typewriters Are A Hit and Oh, Brother! Due to some scheduling difficulties, we were finally able to use the typewriters on Friday. Our Journal topics for Fridays are "freewrites" so it was perfect opportunity to have them used. They could take all the time they needed to get comfortable with the typewriter. I front-loaded instruction on Thursday with a small presentation all bout the CTP and some of the data behind using the typewriters. The Thursday presentation primed them for the excitement on Friday. The sound of 20 typewriters tapping away is really very familiar. For three years my work day has been filled with the whack of type bars against papers and platens. I have grown so accustomed to the sound that the absence is more deafening than the presence. Of all the classes who have used typewriters, this group was the most enthusiastic. They really loved giving it a chance. This group of kids really paid attention to the into diagram and had very little trouble getting started. You know something is a success when it's time to switch activities and their is an audible groan of disapproval. I think that over the course of the school year the typewriter love will increase. I mention 20 typewriters because I have decided to keep 20 in constant rotation; moving out typewriters that become damaged or a little worn out. I have enough of a back stock that I can be a few months behind on repairs and still have 20 completely working typewriters. As always Royals make up a large portion of what students use, but there seem to be more and more Brothers moving through the ranks. 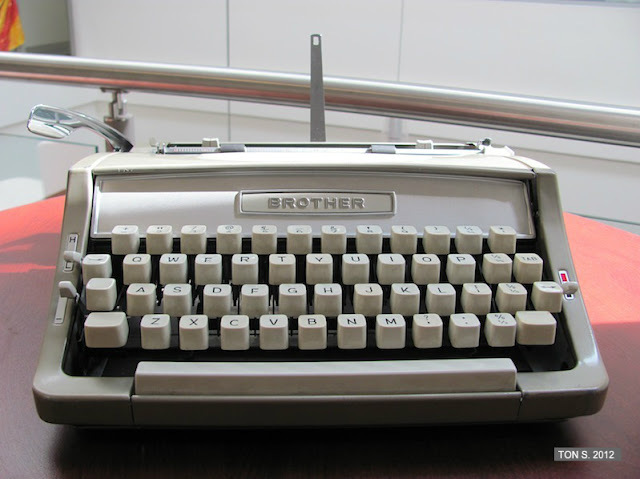 Brother typewriters have proven to be incredibly rugged and dependable. The harsh view I held of the Performer has been worn smooth by nearly three years of dependable service. I am nearly amazed at how student-proof they are. While the pile of Olivettis gets larger and larger, the brothers keep on working. In the course of repairing the few minor problems that so many of Brother's parts are completely interchangeable. Screws tend to be a uniform size. They are easy to work on because components (like the escapement) are easily accessible. The bottom line is that they can survive in my classroom and that is no easy feat. I am slowly becoming a convert. They tend to grow on you. 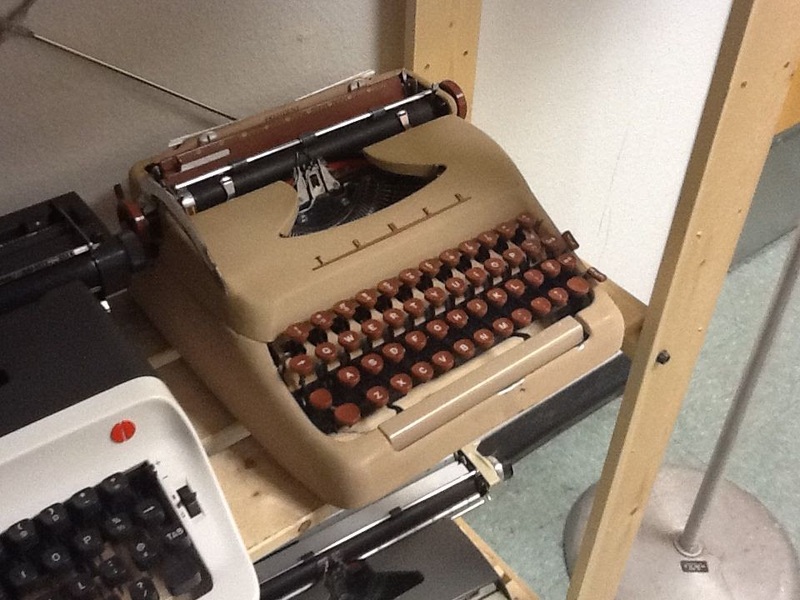 That brings me to one of the newest typewriters to make an appearance in the classroom. Ton S. spoke about this Brother in his blog. I got an email saying that he would like to send it on to my classroom rather than keep it. I was more than happy to take it off his hands. I had a couple of Smith-Coronae that needed to be retired for repairs. That funny little clasp they use for linking the segments tends to fail under heavy use. It's one of the perennial problems with 1950s Silents and their Galaxy siblings. Ton was a gentlemen of the first order and paid to have this shipped over to me. It arrived packed incredibly well, but the carriage was freewheeling just as Ton had described in his post. The fix did not hold. The carriage would just spring all the way over to the marginal stop. It was freewheeling in the worst way. I cracked the case open to get a closer look. 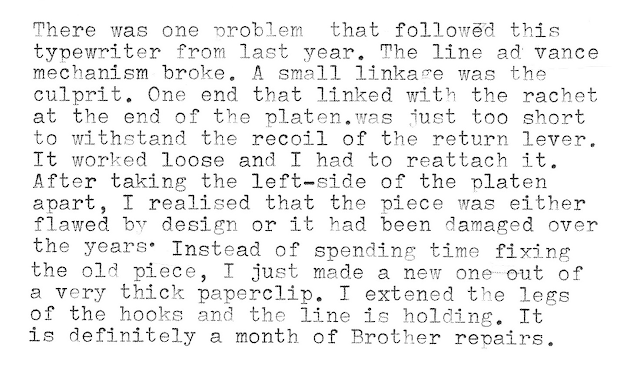 Just as Ton had described, there was a hairline fracture on one end of the escapement paddle (is that what they are called?). You know, its the thing that swings into place to stop the carriage from advancing more than one space. 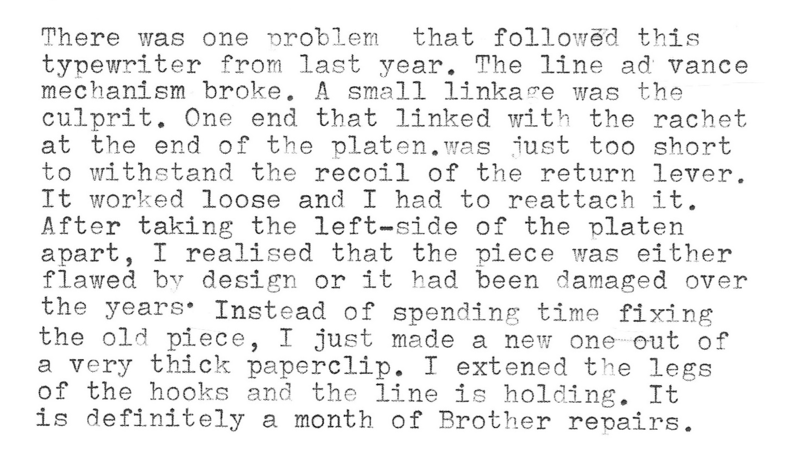 I could see that the crack had caused the little prong of metal to be bent back so it was not engaging with the escapement wheel teeth. I looked at it closer and as soon as I touched it the whole enchilada fell apart. It was being held on by a thread. Clearly the trip over hill and dale proved to be too much for Ton's repair. The paddle was held in place by a pivoting screw and it was very easy to remove the part and have a closer look. I was able to save the little piece that fell off. I looked at the piece and (initially) I thought that I would try to make a new piece out of some scraps I had around here, but I noticed that there was a vertical post attached to the underside. This little bit is part of the carriage release linkage. Pressing the carriage release button presses on this post and swings the paddle out of the way of the escapement wheel. Obviously, I wouldn't be able to manufacture a piece easily so I looked to fixing the piece I had. Glue wouldn't be strong enough unless I had a very strong and powerful glue. Something like…J.B. Weld might do the trick. I looked at the piece and saw that the break was clean. There were no gaps when the two parts were put together. I would need to make sure that the J.B. Weld bridged the break to add to the strength. Also, the piece was fairly smooth. Sanding it well to create a key would be very important. I took out my rotary tool and used an emery bit to roughen up all the sides that would touch the epoxy. I mixed up a small amount and glued the pieces together. I was totally prepared to have this not work at all, so with apprehension I let it sit until the epoxy cured. This was what emerged 24 hours later. 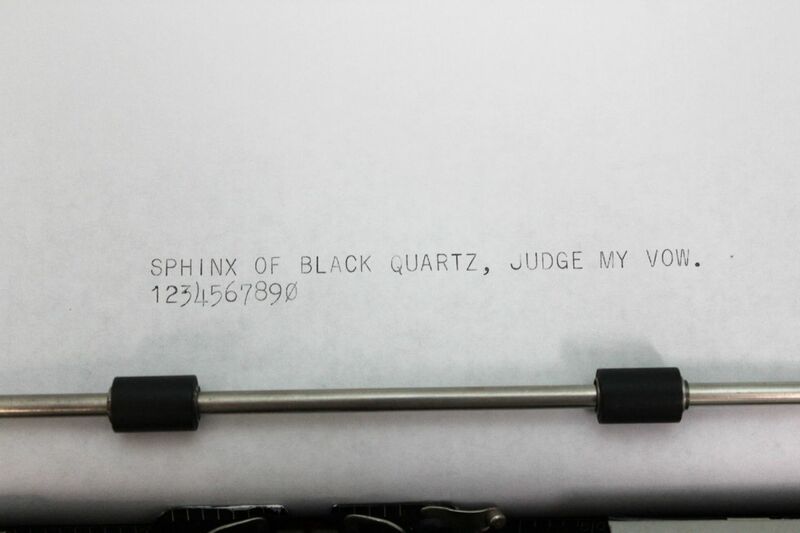 I reinstalled the piece in the typewriter and it works like a charm. Time will tell how well the epoxy will hold, but the package says it is rated strong at 3,000 PSI (That is tensile strength.) with shear strength of 1000 PSI. The proof is in the pudding. It works. The joint is the weakest part and I assume that it will only be a matter of time before it fails. This, however, will buy me time until I find a suitable replacement. P.S. Ton, you are awesome! So if this blog's sub-heading is "Classroom Typewriter Project" I am sure you are noticing a lack of classrooms and projects. 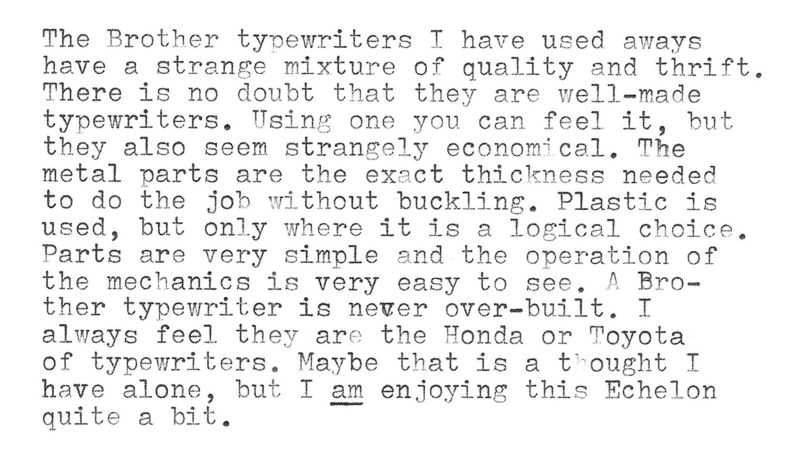 Typewriters? Plenty of those, but very few classrooms and projects. Well, I am happy to say that the final spool has been wound and the ribbons are set to go back into the machines. It looks like Tuesday will be the introduction to the project with a presentation for my classes and the first typed documents will be coming out of the machines shortly after that. Ton's' second donation is still in a case at home. I am going to be taking it to school on Tuesday. If I remember, I'll post a copy of my presentation for everyone to see. I also desperately need to update the donors list and the machines currently in rotation. So, in reality, there are quite a few projects.